From the garden to the kitchen and into a dry or frozen pantry, there are a few ways to extend the life of fresh herbs. Yes, there is nothing quite like taking your fresh basil and creating a bright and flavorful pesto. But, what do you do when fresh is just not an option? Or, what do you do with the abundance you have now and you wish to preserve it for later? For years I dehydrated various herbs for cupboard storage to use in a pinch, but it was never the same as using fresh. After having a bad experience bringing plants loaded with bugs into my home, I knew I had to switch things up. Who wants to enter a season of closed doors with tiny creepy crawlies all over the kitchen?! I proceeded to start seeds and grow fresh herbs inside. In this way I was able to mitigate the bug issue but the quality just wasn’t the same. Nothing beats garden soil and plentiful sunlight. This year I’m taking a different direction and freezing my herbs in the manner in which I use them. 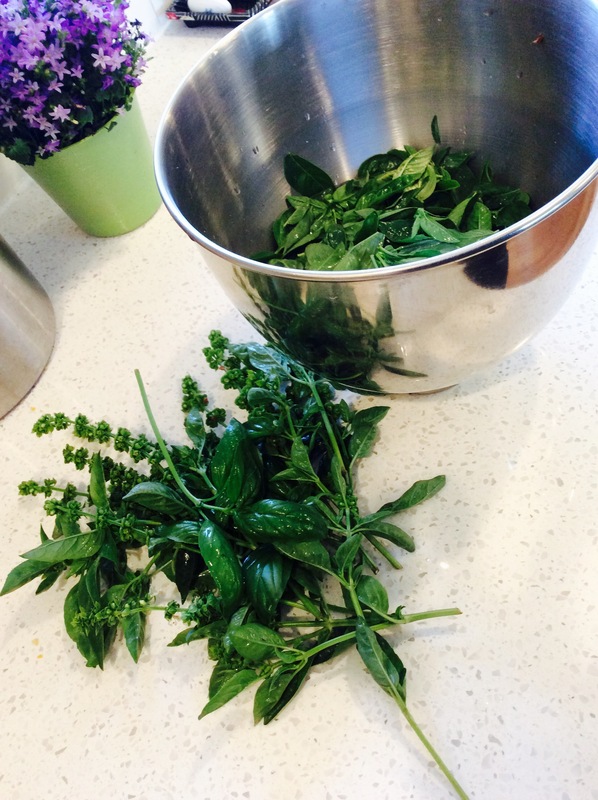 Fresh basil pesto is a good example of something I’d love to use throughout the year. Since there are no USDA approved means to pressure can pesto making it shelf stable, I decided to give freezing a go! Here’s my twist on a delicious pesto with a delightful zing. By adding the vinegar and citrus acidity, your tastebuds will shout for joy. The perfect pesto isn’t an exact science so you can adjust the last four ingredients to suit your tastes. Combine the basil, oil, vinegar, citrus juice and minced garlic in a food processor or blender. Add the grated cheese, pine nuts, salt and pepper; blend until smooth. Taste and adjust seasoning as desired. This is a double batch recipe. To freeze, you can simply place any mixture in ice cube trays and add to a freezer bag once solid. 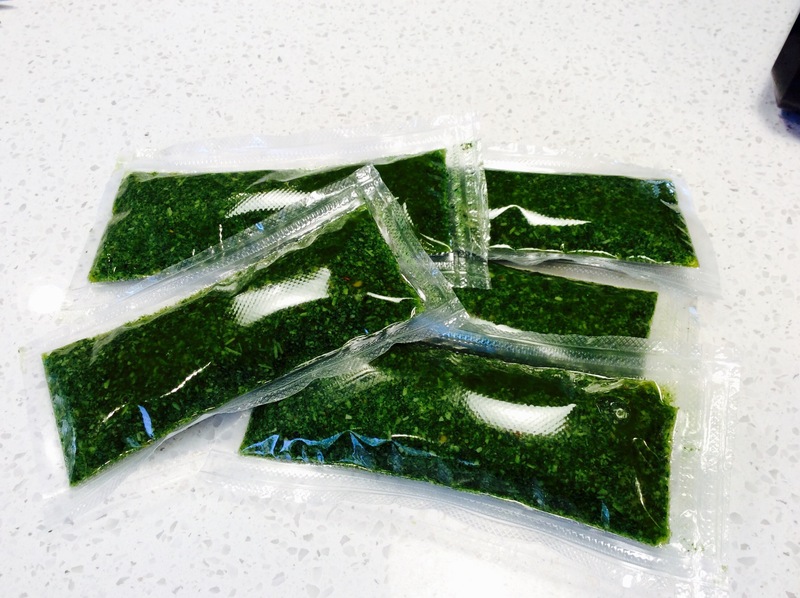 I took things a bit further and created meal-sized pesto packets out of vacuum seal bags. It was easy to make them in whatever size I desired. Now, I can simply run to the freezer and grab a pack without experiencing messy hands. You can easily freeze other herbs by utilizing your favorite recipe or simply by immersing in water. The possibilities are endless! Imagine fresh cilantro and lime juice, frozen for use in mid-winter salsa. Thyme, rosemary and lemon juice would be fabulous with roasted chicken. Don’t be afraid to use what you have instead of letting it wither away with the first frost. Many of us, myself included, have become accustomed to adding dry herbs to our dishes. A single cupboard that previously made up my spice rack has now become two…they literally ‘floweth over’. I love having choices and equally I love having my shelves filled with what I’ve grown myself. Dehydrating my own fresh herbs ensures they are fresh and full of flavor. Better yet, I know the plants are not treated in any way. Pesticides and herbicides are not things I want lingering on my palette. The easiest way to dry your own herbs at home only requires string and a nail or hook. That, and a gentle breeze can prove to be helpful. Bunching and hanging fresh herbs is a time honored method to drying herbs for future use. When drying fragile herbs or those with seed, I adjust my approach and hang the bunches inside of a paper sack. This will help collect much of what might fall off while allowing the herbs to continue drying. For instance, this method works well for dill. Most of the time I use more modern means of drying herbs and spices. 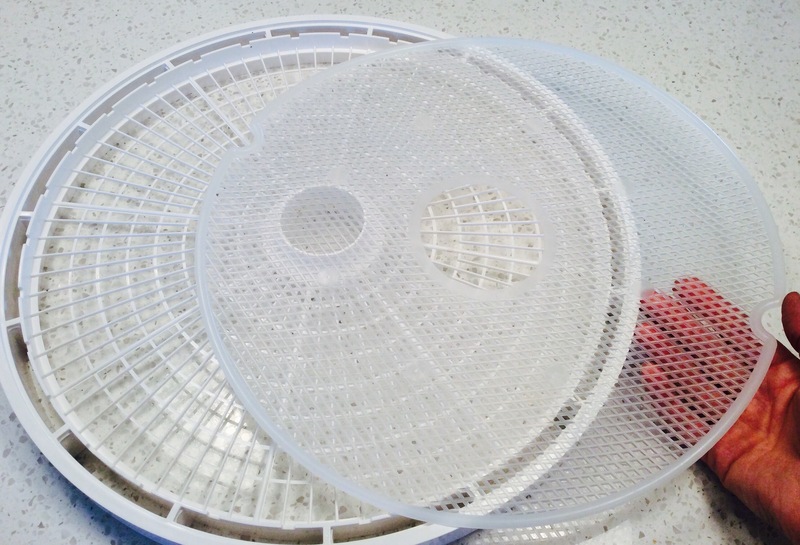 Utilizing a multi-temperature dehydrator quickly reduces the amount of time required to dry my herbs. What use to take me weeks, now takes days. Using a special herb drying mat reduces the sifting-through of my spices. Drying with the leaves attached to the stalk also helps keep things intact. Once everything is ‘crispy dry’ removal of seeds or leaves is a cinch. I like to store my herbs in air-tight containers. Reused spice containers or canning jars fitted with various lids work excellent. If you like labels, canning labels work well for this function. 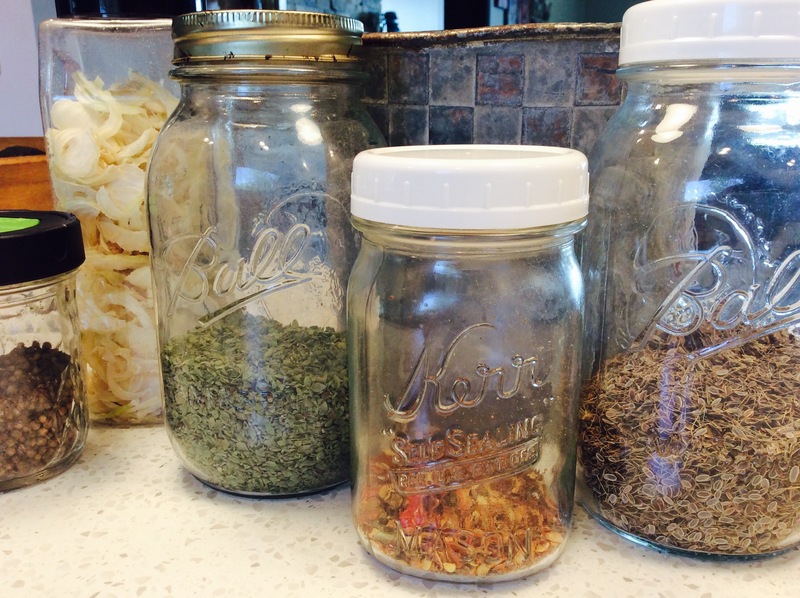 No matter your chosen preference for storing herbs the process is flavorfully rewarding. With a little time and creativity, some of the best recipes are born. If you’ve never considered preserving your herbs in the past, you are welcome to start with whatever is most comfortable for you. If you have a favorite herbaceous sauce that takes time to prepare, try to freeze it. The goal should be to use what you have now in order to save time in the future while preserving the freshness for later!